Daily Illuminator: Play Munchkin: X-Men Edition This Weekend! May 20, 2017: Play Munchkin: X-Men Edition This Weekend! Enroll at Xavier's School for Gifted Youngers and gear up for this weekend, because game stores around the country are hosting Munchkin: X-Men Edition Demo Days, May 20-21! USAopoly is teaming up with local game stores around the country to bring you the X-Men, with demo events and free swag! 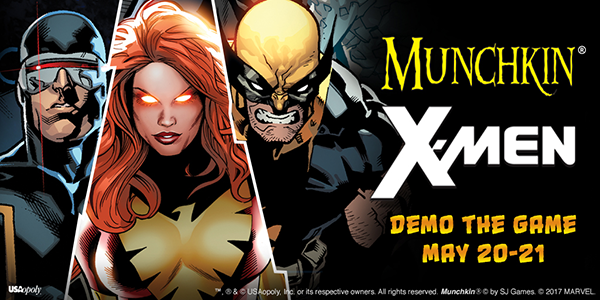 Simply find a participating store, attend the demo, and get some brand-new promo loot from Munchkin: X-Men, including a new bookmark and the X-23 card. All that just for taking on legendary Marvel foes, collecting iconic weapons like Silver Samurai's Katana, and teaming up with heroes like Wolverine to get to level 10! Check out USAopoly's blog post to find a nearby store, and check with the store for the event time. We'll see you in the Danger Room!